Prepared using no salt added canned diced tomatoes and low sodium chicken broth. In a large skillet, cook the ham, onion and garlic in oil until onion is tender. Stir in the broth, tomatoes, parsley, thyme, salt, cayenne, chili powder, pepper and bay leaf. Bring to a boil. Stir in rice. Reduce heat; cover and simmer for 15 to 20 minutes or until rice is tender. Add uncooked shrimp; cook 5 minutes longer or until shrimp turn pink. Discard bay leaf before serving. 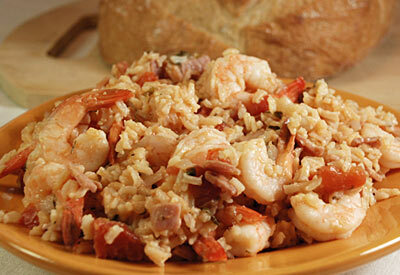 *If precooked shrimp is used, add shrimp, stir to combine, remove pan from heat and cover for 5 minutes before serving. Note: Tails can be removed from shrimp prior to adding to the skillet, if desired.